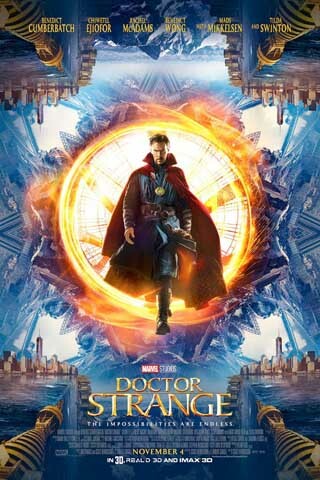 Dr. Stephen Strange's (Benedict Cumberbatch) is a super-arrogant brain surgeon with a sarcastic manner that would be a nightmare to work with. His long-suffering girlfriend Christine (Rachel McAdams) – also a surgeon would agree - he is an insufferable prick. Dr Strange’s life changes after a car accident robs him of the use of his hands. Hopefully they also took his license away as his driving was foolish in extreme. He is a wreck, wakes up to discover they had destroyed his hands and with it his living. He tries every treatment under the sun to find a cure and blows all his money, but nothing works. In desperation he seeks someone who miraculously recovered from a spinal condition that should have prevented him from walking again ever. This sends him in a new direction towards spiritual healing, in a mysterious enclave in Katmandu. He is told that spiritual healing can fix his hands but our Stephen Strange is not one for fairy tales. Dr Strange discovers that the enclave is at the front line of a battle against unseen dark forces bent on destroying reality. A former disciple of the Ancient One, played by Mads Mikkelsen (in very bad glitter eye shadow) has gone to the dark side. Training is hard and desperate measures are employed to test the new apprentice. Before long, Strange is forced to choose between his life of wealth and fame or leave it all behind to defend the world as the most powerful sorcerer in existence. Yes there are similarities to Batman – he has no superpowers (thank god) but must master new magic techniques. Luckily Dr Strange is ‘bright’ with a photographic memory. He is also funny and naughty and like Robert Downey Jnr in Ironman, we tend to overlook his arrogance because he amuses. Cumberbatch does his usual thing and of course that's why we like him, whether playing Holmes or Dr Strange. There's some stylish battles and a great out-of-body scene back in the hospital between Strange and the evil villain. The special effects are amazing (Inception on steroids) and the magic is spectacular. His teacher is the equally arrogant ‘Ancient One’ played by Tilda Swinton. More than a match for Dr Strange. Dr Strange a super-hero movie that is a definite cut above the rest.